When we run a business or execute a project, we set clear goals of what we want to achieve, create detailed plans, devise strategies and set up milestones. But leadership, just like life, is ambiguous and paradoxical. The rate of change is so rapid these days, that ambiguity is ubiquitous, and certainty, an illusion. Hence, ability to thrive on uncertainty is crucial for our growth as leaders and professionals. It is amidst uncertainty and ambiguity that we tend to be at our creative best, doing a lot of intuitive thinking and coming up with solutions as we go. Fresh perspectives emerge and new insights unfold as we work our way through the foggy road ahead. When you reach the destination you set out for, working through all the ambiguities, the satisfaction level is also much higher. Not only because you achieved the goal, but in the process, you learned a great deal about people, situations, paradoxes and about managing uncertainty. Your work shines through. Having said that, you should never be a source of ambiguity as a leader. Your job as a leader is to provide clarity to your team, while managing the external uncertainties. Assess your inclination towards certainty. Do you get frustrated when faced with an uncertainty or paradox? Does a lot of certainty give you a sense of comfort? If yes, what behaviors could you change to be more comfortable with external uncertainties, work through it and get more creative? 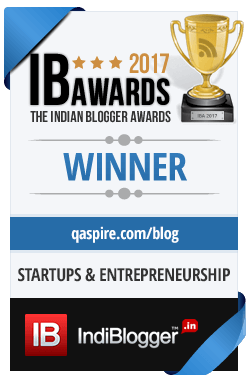 Stay tuned to QAspire Blog: Subscribe via RSS or Email, Connect via Facebook or Follow us on Twitter. Join in the conversation! Tanmay, we certainly have to learn to accept that we will be faced with uncertainties no matter how well we plan, even if we are executing the plan in its entirety. One of the biggest ironies of life is that we think we are in control and yet we actually are not! @Thabo – I totally agree. In fact, just this morning, over a cup of tea, I was discussing with one of my friends that no matter how much you plan, you have to be prepared for situations that just throws us out of gear. Planning is very important, but then being ready for ambiguities is equally crucial. Thanks friend, for your support here, and the comments, for which I am grateful. A nice topic raised in this post – uncertainties that challenges the plans. Ambiguities are always expected, but at one stage what we can possibly do is identify the pattern of ambiguities raised periodically in projects and after the project, frame some strategies to prevent them to get repeated. Certain right risk items identified at right time with right mitigation plans can help doing this. Most project plans does this but still a point to share as in long term we would need to remove certain repetitive ambiguities with similar nature and welcome the new ones to come as challenges. @Jay – You bring up the point of preventive actions, which process improvement teams generally take up. However, not all uncertainties can be foreseen/planned – and even after the risks/preventive measures are factored in the plans – uncertainties still come up. With the rate of changes in businesses being so fast, this is likely to happen even more. That is the only reason, why it is important for leaders to 1) Prevent/Mitigate uncertainties based on their past experiences to give clarity to teams 2) Be prepared to face/embrace new uncertainties that they can leverage to get more creative. Great post, Tanmay. I think one key way leaders can prevent being the source of ambiguity for their organization or team is to focus on what they can control instead of worrying about what they can’t. This way, regardless of market, situational, or environmental changes, your team will know exactly what to expect from you as your focus is not on how to anticipate/respond to the myriad possibilities, but on adapting those meaures under your control to respond accordingly to these changes. .-= Tanveer Naseer´s last blog ..Three Rules of Three for Successful Communications =-. @Tanveer – You make a great point Tanveer. Leaders can bring some order and focus on solutions when they focus on what they can control. I have seen external uncertainties bogging down leaders who think too much about transformation, get frustrated and finally put down their guns. But as you rightly suggest, if they can focus on their circle of influence, and then do something about it, managing change becomes a whole lot easier. Thanks for the comment and have a great remaining week.